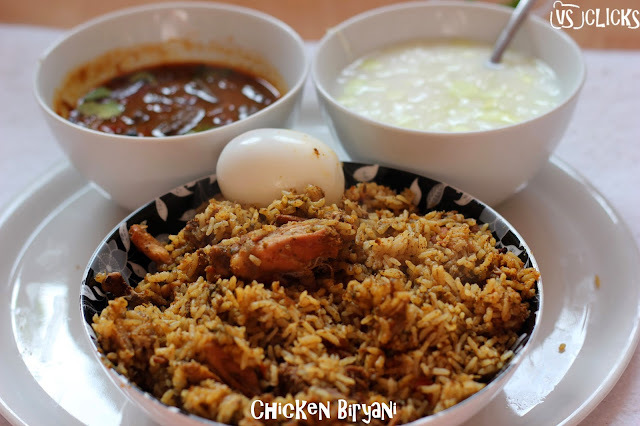 Vinayaka's Kitchen: Chicken Biryani - How-to? 1. Take half bunch of Coriander leaves, half bunch of Mint leaves, 1 big sized Tomato and 3 Green chillies in a mixie. Add little water and grind it well to make fine paste. 2. Clean the chicken after dipping it for five minutes in warm turmeric water and soak the rice for 30 minutes. Cut onions and tomatoes and gather the other required ingredients. 3. Heat up the pressure cooker, add oil and ghee and then heat well. Add Cloves, Cardamom, Cinnamon, Bay leaf, onion and fry the onion until translucent. 4. Add Ginger Garlic paste and stir it until the raw smell goes off. Add Mint leaves and fry it for 30 seconds. Add tomatoes and sauté till it get mushy. Add coriander leaves and fry it for 30 seconds. 5. Add the Mint paste and stir it until the raw smell goes off, add curd and stir it for a minute and then add chicken to it. 6. Add Salt, Turmeric Powder, Red Chilli Powder, Coriander Powder (Dhania Powder), Garam Masala Powder and Jeera Powder (for digestion) and slowly mix it well to combine all together. Add two cups of water and pressure cook it for two whistles. 7. Once pressure is released, open and stir it for few minutes. Add soaked rice after draining the water completely, add 1 cup of thick coconut milk and 3 cups of water to it. 8. Pressure cook for two whistles. Once pressure releases, open the cooker and serve without breaking the rice in a bowl or in a plate along with Raita or any spicy gravy. #1: This goes well with Raita and spicy gravy. #3: We're using Sona Masoori hence we are adding 3 cups of water for 1 cup of rice and pressure cooking it for two whistles. Follow your instincts for the number of whistles. Chicken Biryani, a rice-based dish made with spices and chicken. It is a popular dish in South Asia, though it is originated in Turkey. My Hubby is a mad fan of Chicken Biryani and he never fails to appreciate whenever I cook Biryani for him. All thanks to my Grandma who taught me this :) I am happy to do justice to it. Do try it out and you are welcome to post the pics here. Amazing representation with photos and recipe. You both are brilliantly leading VK on the path of excellence.